Badam Halwa/Badam ka Sheera/Almond Sheera are the different names, this delicious dessert holds. Can we pick any body who says no to this yummy Badam Halwa? I am sure, you can never find any one saying no. Though this is an easy to make and healthy dish, it is quiet heavy. But limiting the spoons of this heavenly taste is indeed a toughest job to do. Isn't it? 1) Soak the badam overnight or boil it for few minutes. You will be able to see the puffed skin after soaking or boiling. 2) Remove the outer skin for all the badam and set aside. 3) Soak the saffron in 2 tablespoons of warm milk. 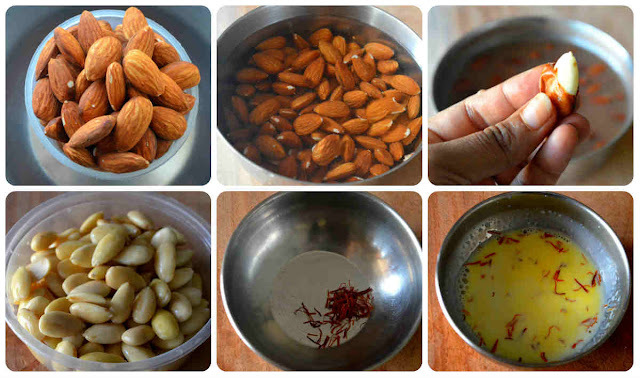 3) Transfer the badam to a mixer and add milk to it. 4) Grind the badam to coarse paste similar to that of idli batter. When you pinch the paste, you will be able to feel the rava consistency. 5) Heat a heavy bottom pan and add 1/4 cup of ghee to it. Next, transfer the badam paste to the ghee and start stirring. 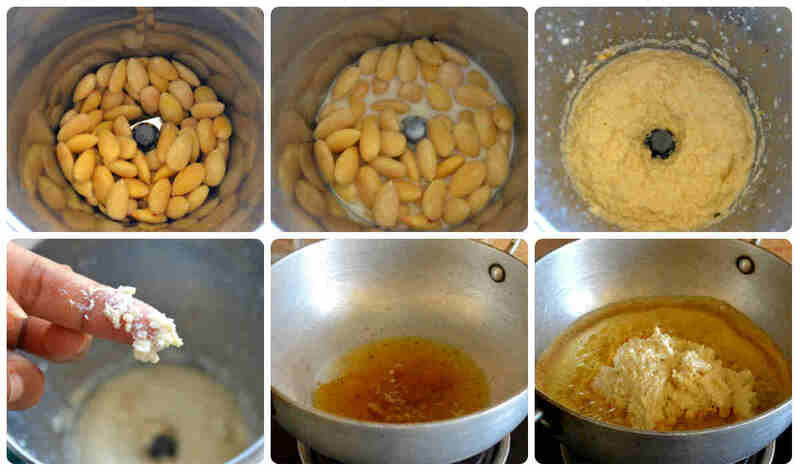 6) Keep stirring the badam paste till it gets half cooked in ghee, this will take around 3-4 minutes till nice aroma. 7) Add the sugar and mix well. 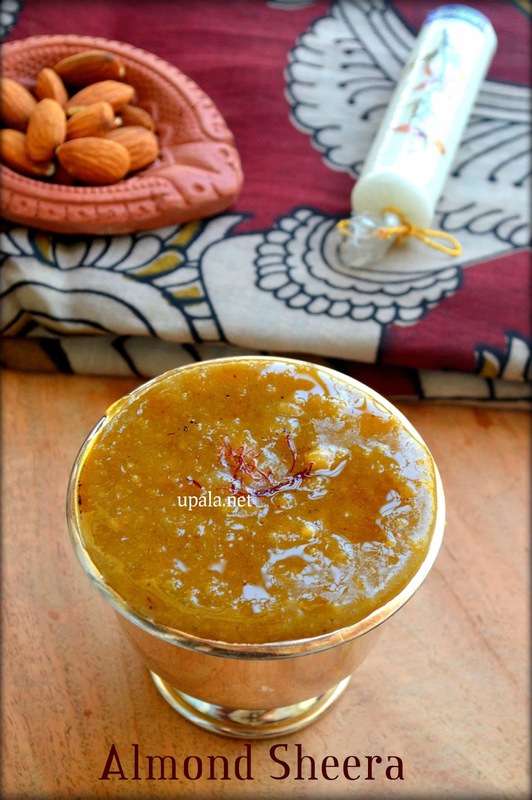 The thick badam paste will turn into liquid consistency after sugar dissolves. 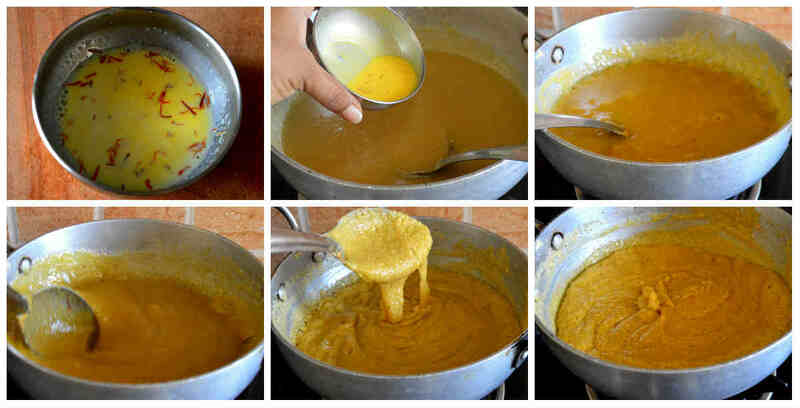 8) Now, pour the saffron soaked milk along with saffron strands and start stirring again. 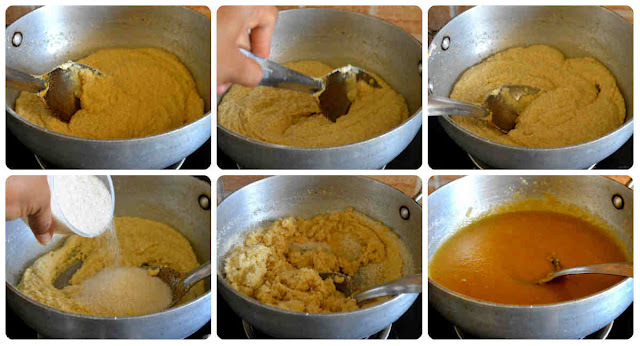 9) Keep on stirring by adding all the remaining ghee at regular intervals, until you get nice halwa stage. At this stage, the badam paste will turn little hard and start leaving the sides. When you pinch a bit of halwa and try to form a ball, it needs to form a smooth and nonsticky ball. Also you will be able to see halwa leaving ghee on the sides. 1) If you feel the halwa is sticky in consistency, you can heat the halwa and keep stirring to get the desired consistency. 2) If in case, you have done too much of cooking that the halwa has turned grainy after cooling then sprinkle few milk and heat the halwa in low flame just for few minutes to get back to halwa consistency. 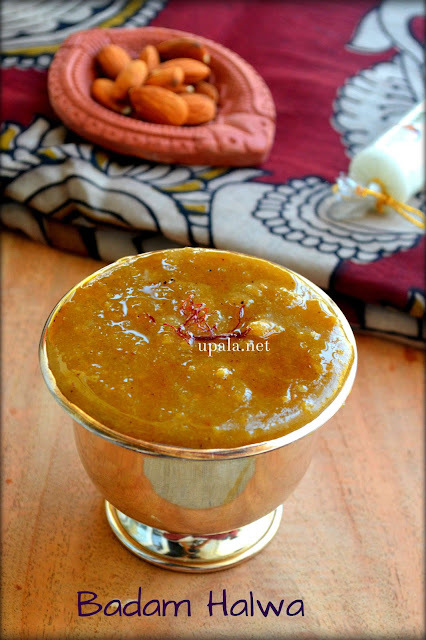 3) Badam Halwa might get burnt at the bottom easily so it is better to do continuous stirring. 1) I have added the sugar directly to the Badam paste, some might prefer to make a sugar syrup and then add to badam paste. You can follow an method according to your convenience. How is this eaten? Is it eaten on something, or just by itself?